Give me a break, Breakfast Television. 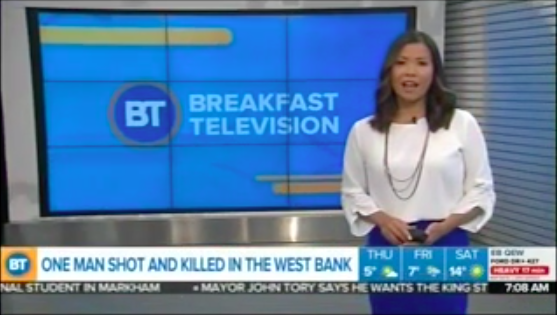 Today, a Palestinian terrorist armed with a knife tried to stab an Israeli civilian who in self defense shot the terrorist dead, and yet, Breakfast Television’s reporting tacitly implied that the terrorist was the victim. BT’s anchor led her report by emphasizing and tacitly drawing viewer sympathy to how “A Palestinian has been killed and another seriously injured according to the Israeli military.” The anchor then went on to state that the Israel Defense Forces claim he tried to stab an Israeli resident, but this claim gets discounted and doubt is cast when the anchor claims that “Palestinian officials say they want to see surveillance footage to verify the claims”. Tell BT that it’s was wrong to whitewash Palestinian terror.